Hilton Grand Vacations Club at The Kalia Tower offers an unparalleled travel experience. With a highly desirable location and spacious accommodations, it's no wonder that so many people purchase a Hilton Kalia timeshare for sale. Magical vacations are guaranteed at this special Hawaiian resort. The Kalia Tower is part of the Hilton Hawaiian Village, enviably situated in Honolulu. The excitement of the city is steps away, and so is the beautiful beach. This provides guests with the best of both worlds when they buy a Kalia Suites timeshare. The resort encompasses 22 acres, all of it lushly landscaped and packed with activities. There are no fewer than five pools, and each one is more spectacular than the last. Actually, there are six pools if the one that's just for kids is counted, too. The Paradise Pool is built for family fun while the Super Pool boasts 10,000 square feet of water borne fun. With so many pools to choose from, there's something for swimmers of all abilities. Hilton Grand Vacations Club at The Kalia Tower is a great choice for the active traveler. Each day is packed with adventure, and there's not even a need to leave the resort. Guests may participate in hula or ukulele lessons or unwind with yoga. Instructors at the resort teach snorkeling and surfing. Live music is played daily at two of the restaurants, and each evening is marked by a ceremonial torch lighting. The Waikiki Starlight Luau takes place most nights of the week and guests who have tried it consider it a can't-miss attraction. Clearly, a Hilton Kalia timeshare for sale is an excellent idea for anyone wanting to enjoy fun getaways in a Hawaii resort that's constantly improving and evolving. Most people buy a Kalia Suites timeshare because the accommodations are fantastic. These particular rooms are found on floors 12 through 18, guaranteeing amazing views of the ocean or landscape. Each room is elegant and equipped with many of the comforts of home. 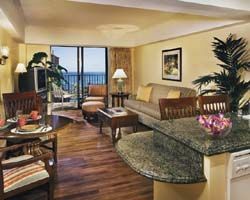 Guests may choose from between a studio and a one bedroom suite that features a private lanai. Either way, guests will also enjoy full kitchen facilities in their accommodations. Vacationing here is a great excuse to try preparing some traditional Hawaiian fare. Of course, with 20 restaurants on site there's never a need to cook. The resort provides laundry facilities on each floor, making it easy for guests to keep their clothing impeccable throughout their stay. Guests can enjoy a full vacation without ever leaving the Hawaiian Village. Nonetheless, the resort provides a helpful concierge service through which guests can reserve all types of excursions and activities. The beach lies just beyond the bounds of the resort - one of the widest stretches of sand anywhere on Waikiki, ensuring that there is plenty of room for everyone to enjoy the shore. The city, complete with numerous shopping, dining and historical experiences, is also conveniently close by. There is no better way to spend vacations than by choosing a Hilton Kalia timeshare for sale. Contact Hilton Grand Vacations Club at The Kalia Tower Specialist Today! Something for everyone. You don't need to leave home but if you do, it's also close to everything!! We all go to the Hawaiian paradise to find heaven on earth. Even better than the balmy ambiance and climate is the HILTON EXPERIENCE! 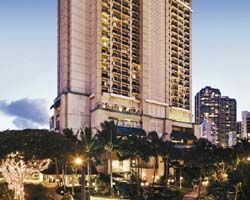 Apart from the short stroll to Ala Moana shopping centre, there is no need to go anywhere else than this resort. Numerous water sport activities and choices, bars, restaurants and music. All in a family safe clean environment that is as full on or quiet as you want. Better still it is easy to sleep, a true heaven on earth!